Long-term harvest of green sea turtles and their eggs led to a major decline in the population in the last century. In 1975, the National Marine Fisheries Service (NMFS) proposed listing the green sea turtle as threatened under the Endangered Species Act (ESA). In 1978, NMFS and the US Fish and Wildlife Service listed the Florida and Pacific Mexico breeding populations of green sea turtles as endangered under the ESA and the other populations as threatened. In 1998, NMFS designated critical habitat for the green sea turtle in Puerto Rico. In 2007, NMFS completed a 5-year review for the species. 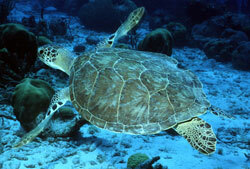 For general information on Green Sea Turtle, see the Green Sea Turtle species profile page.